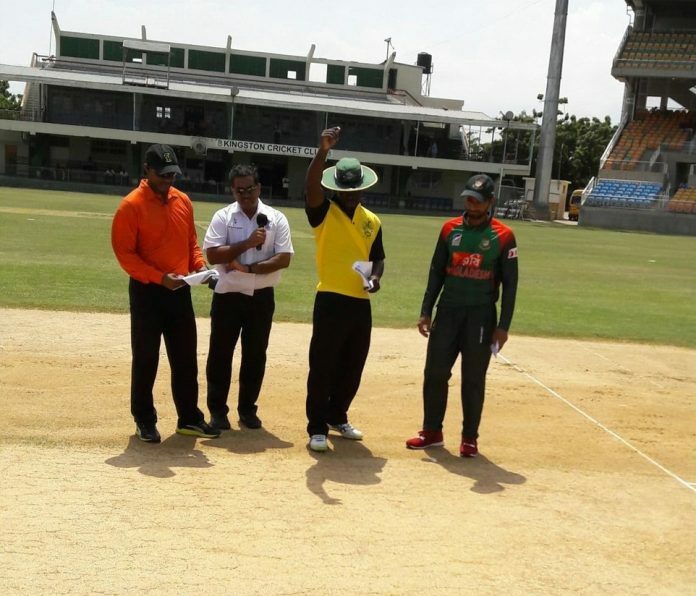 Bangladesh clinched victory in the only one-day practice match against UWI Vice Chancellor’s XI by 4 wickets at Sabina Park. The 3-match ODI series between Bangladesh and West Indies will start from July 22 at Guyana. Mahmudullah captained the side today in the absence of regular captain Mashrafe Bin Mortaza and Vice-captain Shakib Al Hasan. Mahmudullah opted to filed after winning the toss. Mosaddek Hossain’s four-wicket haul put Chancellor’s XI in trouble as they lost 6 wickets for 89. Then Ottley and Hodge made an partnership of 91 and helped them scoring 227 for 9 in 50 overs. Mosaddek bagged 4 wickets for 14 runs. Bangladesh chased down the target comfortably in 43.3 overs with 4 wickets in hand thanks to fifties from Mushfiqur Rahim and Liton Kumar Das. Mushfiqur was remained unbeaten on 75 while Liton was dismissed after scoring 70. Powell took 2 wickets for 32. One-day Practice Match, Sabina Park. Result : Bangladesh won by 4 wickets.